Kandima Maldives launches new range of glorious wedding packages. Does your dream wedding look like this? 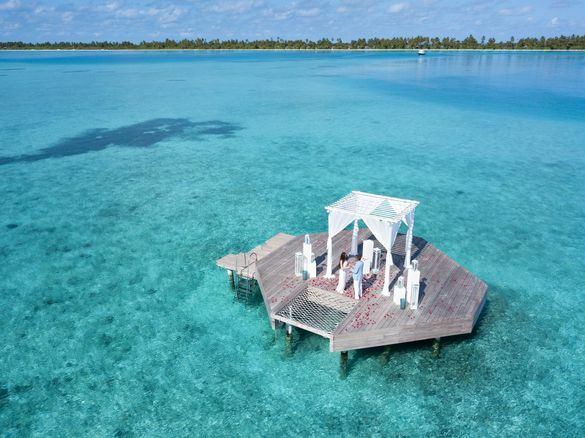 You and your beloved stood on a floating platform over a crystal lagoon with the Indian Ocean a blissful backdrop as red rose petals shower down? Or do you prefer the idea of saying ‘I do’ as you press shoeless feet into white sands in the shade of a pretty wedding arch before you sit down for a three course dinner on the beach? Whatever your preference, let your special day be unforgettable with the help of Kandima Maldives’ wedding planners who will tailor make a wedding ceremony just for you. Newly released packages range from £1363 (plus taxes) and can be designed for groups of up to 200 guests. I Do With A View – Includes ceremony on the beach or floating platform. A one-tier wedding cake, limo, two-hour photo session. Oh-So Kool Kandima Wedding – Wedding ceremony on the beach with arch, stage and chairs for guests. Cocktails, three course beach dinner, sunset cruise and one-tier wedding cake. Let’s Escape – A wedding ceremony on your own deserted island or sand bank. Also includes a 90 minute spa treatment, sunset cruise and cocktails. Just The Two of Us – A ceremony on the Northern tip of the resort with wedding arch and stage, private cocktail session, 90 minute spa treatment and one-tier wedding cake. Let’s Go K’razy – One for the photo album as you will be photographed doing whatever you want in your wedding garb – kayaking, parasailing, running along the beach etc. Up to 150 photos, makeovers, photo slide show, spa massage for two and a three hour cocktail session. Kandima also host great hen and stag dos and will provide a post-wedding celebration like no other.